Our attendees are the leaders and decision makers from the world’s cutting-edge science centers and museums, nature centers, aquariums, planetariums, zoos, botanical gardens, and natural history and children’s museums. They come to network, attend more than 100 sessions, and learn about your products or services. Meet them in Toronto in the Exhibit Hall. for Exhibitors, Sponsors, and Advertisers. 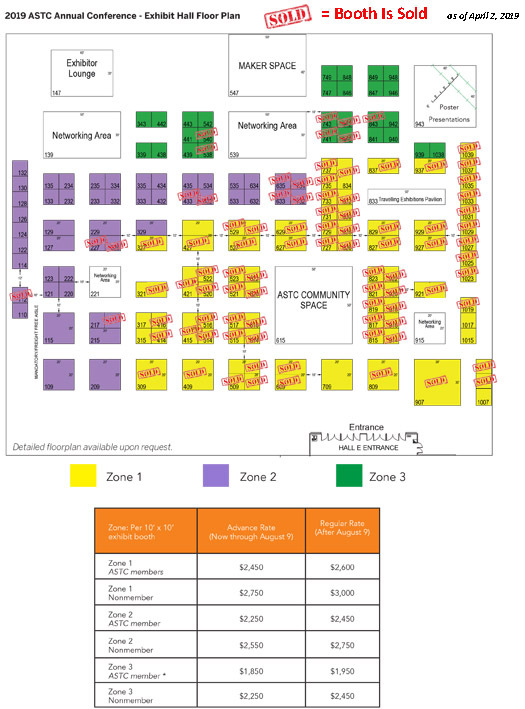 Click to see the current 2019 Exhibit Hall booth map below in more detail. See who was part of the #ASTC2018 Exhibit Hall. More than 75% of conference attendees are the decision makers for their institutions. Nearly 90% of conference attendees visit and spend more than three hours in the exhibit hall. Many visit the exhibit hall to learn about new products and services they can buy for their museums, as well as to network with vendors and fellow attendees. The majority of conference attendees attend the conference to obtain exhibit-related information and education. Conference attendees represent, on average, 47 countries on six continents. ASTC’s Annual Conference is the largest and most important event for more than 1,750 science center and museum decision makers globally—built on quality of attendance as much as quantity. No other venue or resource provides as much opportunity for face-to-face contact with your customers. ASTC cares about maximizing your return on investment and is working hard to make a fresh, dynamic exhibit hall that you won’t find anywhere else. Seven hours of noncompetitive Exhibit Hall time over the two days the Exhibit Hall is open. NEW in 2019 – Dedicated, non-competitive Exhibit Hall time on the morning of day two. ASTC will host four catering functions in the Exhibit Hall for all attendees, including lunch on Saturday, a refreshment break on Saturday afternoon, breakfast on Sunday, and a networking reception on Sunday. For every 10′ x 10′ exhibit booth you purchase, you receive two complimentary, full-conference registrations. Company listing and 25-word description in the final program, if contract and copy are received by July 1. Standard 10′ x 10′ exhibit space, including 8′-high backwall, pipe, and drape and 3′-high siderail, pipe, and drape. Exhibit space is limited and the show will sell out, so don’t delay—join us in Toronto, Ontario, Canada!